Are you planning a Halloween Bash? The right decorations can make or break your party. Too scary and youâ€™ll have little ones crying to go home, not scary enough and the older kids will be bored. 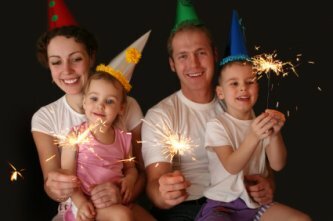 Heres are a few ideas for decorating an age appropriate party. Are you planning a Halloween Bash? The right decorations can make or break your party. Too scary and you’ll have little ones crying to go home, not scary enough and the older kids will be bored. Here are a few suggestions for decorating an age appropriate party. What’s better than walking into a home full of amazing pumpkins carved in all shapes, sizes and even colors? To decorate your home for a pumpkin themed party choose several pumpkins ranging in size from the small gourds perfect for tabletop use to the gigantic prize winning pumpkins perfect for starting the party at your doorstep. Pumpkins even come in white, various shades of orange, and green. And you can find bumpy pumpkins for extra interest. Carve the majority of them either by using pumpkin stencils or by creating the faces yourself. Don’t forget to leave enough pumpkins so that every guest can carve a pumpkin at the party and take it home. For the party that is going to be complete with a terrifying haunted house the decorations can’t be too over the top. Teenagers love to be scared and the decorations should set the tone. You can make your home resemble a mad scientist’s laboratory complete with an examination table, a cart, beakers full of steaming liquid, and a control box. The examination table is easily accomplished by placing a white table cloth over a long rectangular table. At the head of the table, place a large cardboard box covered in aluminum foil. Dials and buttons can be made with bottle caps, buttons, and plastic lids. Run plastic tubing, bought at your local hardware store from holes in the box to a table nearby. On the table place several beakers, bowls, and jars filled with soapy water and food coloring. You can also use liquid nitrogen for a steamy effect. Take care to only let adults handle the liquid nitrogen! To set the stage for a really disgusting party, place cooked spaghetti and doll heads or softened grapefruits in jars. Fill the jars with corn syrup and cap tightly. Let the kids dip their hands into a bowl of ‘eyeballs’ or peeled grapes. Let them stick their feet in a bucket of guts or cold spaghetti. As children enter the party, don’t forget to hang spider webs, scary masks – with or without a head attached, and other scary monsters. You can also use police tape to cover doors of rooms that are not available to guests and you can make a chalk outline of a body on the floor for a ‘crime’ themed party. Harry Potter fans will jump on board for this edgy but not too scary themed party. Wizards and warlocks will cast magic spells. Dim the lights, add stick on stars to the ceiling and walls, and create a bubbling cauldron with liquid nitrogen in the corner on a table. Hosts and hostesses can dress as wizards with long flowing capes, wizard hats, and wands. Suspend clouds from your ceiling, made of pillow stuffing or crepe paper, and hang bats from the clouds. Lightening bolts can hang from the ceiling or be taped to the walls. Old frames, or frames made from gold foil, can be hung on the walls over pictures found on the internet. Outside your home, hang small lights from tree branches or bring a branch or two inside, hang them over your doorway and decorate them with the small lights to create a stunning entrance. If you’re looking for less wizard and more magician, consider replacing the cauldron with a magic hat and wand in the corner. A large cardboard box in the room can be decorated as the ‘saw the person in half’ magician’s prop and a table of cards and other magic tricks for children to try out. Lighted luminaries, placed up and away from children’s hands, can add an eerie and magical glow to any party. Of course no party is complete without some music to set the mood. Mood music can be found at your local library, online via download, and every Halloween scores of cds are released that are chock full of creepy sounds. Wow. this website helped a little bit, but if you want a more scary party, take a look at my party! We decorated my unfinished basement fabulously. We used old halloween masks and old clothes to stuff and make scarecrow type animals. my best friend if mentioned using googly eyes underneth the eyes sockets! We used an alien on my sons bike, hanging from the cieling like ET! We also stuck a glowstick behind his eyes giving an eerie effect. We stuck some monster like hands out of a slammed drawer and hung a severed bloody leg out of an opening in the cieling. We also used funny fabrics and orange and purple lights draped around the pipes. It turned out great! For food we made Witches Brew and just made sprite, lemonade, and hawiian punch. Then we froze gummy worms into ice cubes and floated them along with ice cubes we made in a plastic surgical glove, in a culrdron. We had a sandwich tray from Jimmy Johns, and a lot of munchies. We played kareoke with halloween songs, then the kids went trick-or-treating. they were 13 so, we let them go out alone. they had the most interesting costumes. my daughter was an ipod, her friend was a deviled egg wearing a white shirt with a yellow felt patch and devil horns! Theyere were many more talented and clever costumes too. when the kids got back they sorted candy (did you ever do that as a kid?? I never did, my daughter and her friends have always!) they then played DDR, and enjoyed themselves. Next year we will not have so much blocked off. We didnt want kids expoloring our messy basment so we draped clothes where they couldn’t go. but it turns out kids didnt listen. a girl and her “boyfriend” snuck back there for a makeout session and a lot of the night the other girls were giggly and the boys really didint much care. but all in all, it was great!